It is almost impossible to believe that we are already at the Christmas break and approaching a new year! So much has happened at Woodhaven that the time has flown by. Before I get into sharing some of the most recent events at our school I want to make sure that. on behalf of the staff of Woodhaven Middle School, I take a moment to wish all of our families a safe, restful and fun holiday season with family and friends. Just this week we have had so many events that I want to share with our families. Most recently, today we hosted our Wolfpack Winter Celebration where we invited all 630 students and our staff into the gym to celebrate the contributions our kids have made to their communities. 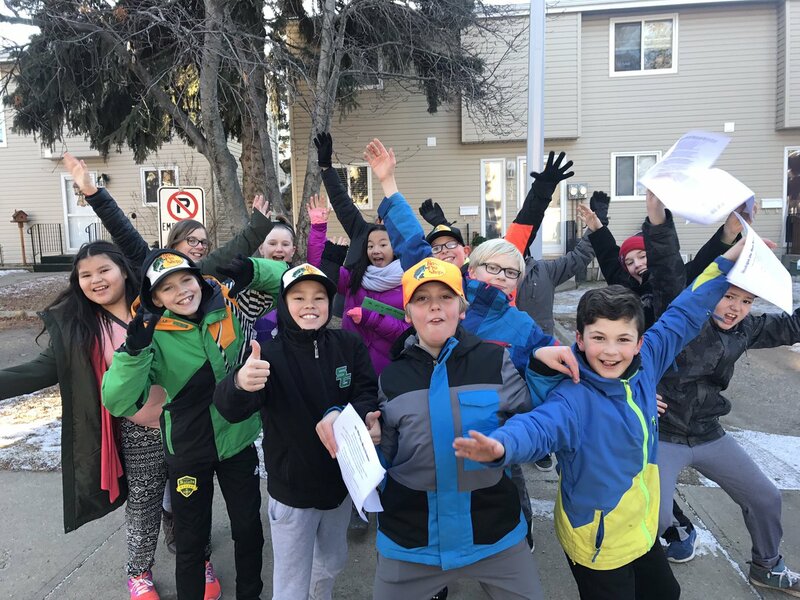 Our kids did everything from making Christmas cards and delivering them to people within our community, to signing Christmas Carols in our community, to organizing door decorating contests, to volunteering in shelters within the inner city of Edmonton. On Thursday evening we were entertained by the gr 6/7 band and the gr 8/9 band at Spruce Grove Composite High School as they performed several pieces and shared their musical talents with us. It is amazing to see how quickly they have progressed with their musical skills! We were also very fortunate to have had the opportunity to join the MCP students and staff of Brookwood School on Wednesday for our second Joint Chapel of the school year. It was a great opportunity to bring our entire MCP program together to share and celebrate. As you can see, there’s been lots going on within the Wolfpack just this last week, and much more to come in the new year! Keep an eye out for information on our newly formed Wrestling Club, which will be open to all students, male and female in grades 5-9 starting on Tuesday, January 16th! Have a wonderful Holiday break. We look forward to seeing you all in the new year! This entry was posted in Engage our Community, Fostering Effective Relationships, Leading a Learning Community and tagged Maranatha Christian Program, wolfpack, Woodhaven Connects, Woodhaven Middle School. Bookmark the permalink.